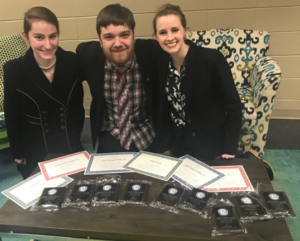 The University of Lynchburg Debate and Forensics Team took 15 trophies home from the Collegiate Forensics Association Southern Excursion Tournament, held February 8 and 9 in Gastonia, North Carolina. The team of Chelsey Fix ’19, Justin Cummings ’19, and Rhiannon Cire ’19 competed against colleges and universities from across the region, including Florida College, Randolph-Macon College, Liberty University, Lenoir-Rhyne University, Hampton University, and Lord Fairfax Community College. The team competed in three event categories. “There are interpretive events, where they take somebody else’s speech or play or poetry and they interpret that,” Dr. Paula Youra, the team’s coach and a professor in the communication studies department, explained. Pictured with their awards (left to right) are Rhiannon Cire ’19, Justin Cummings ’19, Chelsey Fix ’19. Fix, a management major from Lynchburg, Virginia, placed first in After Dinner Speaking, third in Single Dramatic Interpretation, and third in Pentathlon Speaker, which is the best performance in five events over three categories. She teamed up with Cummings for a first place in Duo Dramatic Interpretation and a fourth in Parliamentary Debate (team), and paired up with Cire for a fifth place in Duo Dramatic Interpretation. In the individual events, Cummings, a communication studies major from Lynchburg, Virginia, took first place in Persuasive Speaking, second in Parliamentary Debate (individual), fifth in Pentathlon Speaker, and sixth in Poetry. Cire, an art and computer science major from Montvale, Virginia, placed second in Prose and fourth in Poetry. The final tournament of the year will be held March 1 and 2 in Ocean City, Maryland. It will be the last event for Cummings and Fix, who will graduate in May.